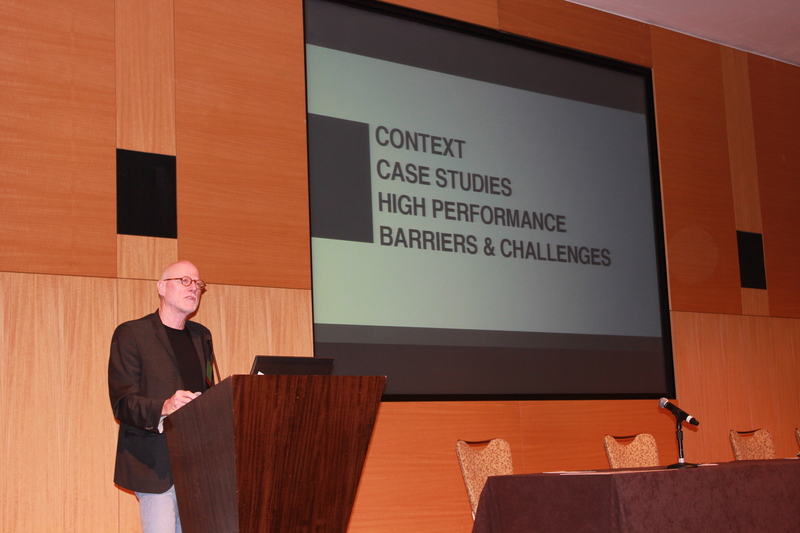 Author and researcher Mic Patterson addressed the audience at the 2015 American Architectural Manufacturers Association (AAMA) Summer Conference, held June 28-July 1, in Seattle. Patterson’s keynote address at the event reviewed the recent evolution in façade technology and applications. He identified current and emerging drivers that are powering this change and discussed the challenges and opportunities now facing the glass industry. Patterson discussed some of the drivers of change, such as geometric complexity, material and process diversity, and acoustical performance. “Most projects referred to as high performance have little to do with performative considerations, but are largely driven by appearance," he said. "The building skin combines considerations of performance and appearance like no other building system," explained Patterson in his address. His presentation also defined differential durability as a measure of performance over time in a specific environmental context. “Materials and service life matter," said Patterson. He encouraged those in attendance to think about environmental impacts and the impact of your carbon footprint as well as cost. However, there are other factors to consider. “Barriers to adoption of high-performance green façade technology include energy, cost, energy prices, building standards and codes, innovation, risk aversion, integration and other factors," said Patterson. “We are building our future problems today,” he concluded. Mic Patterson is a designer, researcher, educator and entrepreneur whose work focuses on the building skin. He has concentrated his professional and academic career on advanced façade technology and structural glass facades. He pioneered the introduction of structural glass façade technology in the U.S. in the 1990s, contributing into the new millennium with the implementation of a diverse body of novel applications, including cable trusses, cable nets and grid shells. Most recently, Patterson participated in the establishment of the Enclos Advanced Technology Studio (ATS) where he works as the director of strategic development.